where did you start and why? and what problems still remain? It was these experience reports that formed the basis of many of the case studies in the DevOps Handbook. I'm proud to announce that the book has gone through editing and design. 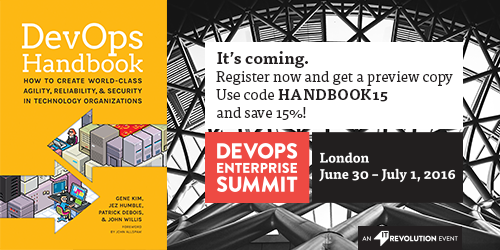 Which means that every attendee at the DevOps Enterprise Summit in London will receive a 490-page print preview copy of the book! Yes, that's right, the DevOps Handbook is done, and will launch later this year — but everyone who is at the London conference will get a custom print-run version. As an uncorrected proof, it will still have some errors in it which have been corrected, but you'll be the first to actually see the book in its semi-final state. I've kept a daily work log since 2010, and I looked for the first entry for the DevOps Handbook. It was February 15, 2011. Yes, that was over five years ago! The original plan was for the book to come out before The Phoenix Project, but there's so much that we've learned about how organizations are successfully putting DevOps principles and practices into place. Since 2011, my coauthors and I have put nearly 2,000 hours of work creating the DevOps Handbook — as you can imagine, Jez Humble, Patrick Debois, John Willis and I are extremely excited that we're finally nearing production of the book! Tickets are available for DevOps Enterprise Summit in London. Enter HANDBOOK15 to receive 15% off the cost of the full-price ticket. And remember, there's only one way to get the galley of the book, which is at the DevOps Enterprise Summit in London, which is only 21 days away! If you have any interest in how large, complex organizations are creating amazing outcomes using DevOps principles and patterns, this is the conference for you! Use code HANDBOOK15 AND SAVE 15%! The post DevOps Handbook is coming! appeared first on IT Revolution.